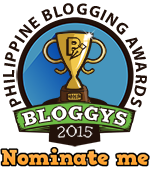 Matias Manalo, Eugenio Yuvienco, Cesario Pelaez, Vicente Diosomito, Maximino Nazareno, Daniel Arenas, Dionisio Guevara, Esteban Yuvienco, Gorgonio Velasco, Alejandro Joco, Miguel Garcia Sr., Pedro Corpus Gervacio Gonzales, Leandro Riel, and Ambrocio Arca. They held their meetings in the house of Anastacio Halili at Rizal Street which was rented by them and unanimously agreed to name their Masonic lodge as Mount Mainam, after the historic mountain between Pico de Loro and the town of Maragondon where the revolutionary Magtagumpay Troops, led by General Emiliano Riego de Dios assembled to defend the towns of Naic, Ternate and Maragondon from the invasion of the Spanish Casadores. Mt. Mainam is a very strategic spot. From the top you could see the Spanish casadores in the south. Below the mountain is a reftile valley surrounded by thick forest where crude shacks were built as shelters of the revolutionary groups. It was in this place where several Spanish soldiers were killed in a historic battle on March 15, 1897, when they attempted to capture General Emiliano Riego de Dios and his two brothers, General Mariano Riego de Dios and Colonel Vicente Riego de Dios, who were then leading the Magtagumpay troops. Due to this historic significance of Mt. Mainam, the Masonic lodge formed in Naic was named after it. The founders filed the necessary petition with the Most Worshipful Grand Lodge of Free and Accepted Masons of the Philippines for a permit to organize a Masonic Lodge under its jurisdiction. Dispensation was granted a week later. The first set of candidates initiated, passed and raised were Jacinto San Juan and Salvador Sarangay. They were then followed by Municipal President Conrado Costa of Indang and Lt. Emeterio Rellosa of the Philippine Constabulary stationed at Indang, Cavite. On June 19, 1919, Mt. 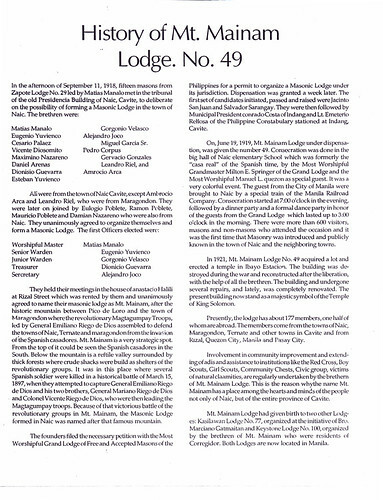 Mainam Lodge under dispensation, was given the number 49. Consecration was done in the big hall of Naic Elementary School which was formerly the “Casa Real” [or Casa Hacienda] of the Spanish time, by the Most Worshipful Grand Master Milton E. Springer of the Grand Lodge and the Most Worshipful Manuel L. Quezon as special guest. It was a very colorful event. The guest from the city of Manila were brought to Naic by a special train of the Manila Railroad Company. Consecration started at 7:00 o’clock in the evening, followed by a dinner party and a formal dance party in honor of the guest from Grand Lodge which lasted up to 3:00 o’clock in the morning. There were more than 600 visitors, masons and non-masons who attended the occasion and it was the first time Masonry was introduced and publicly known in the town of Naic and the neighboring towns. In 1921, Mt. 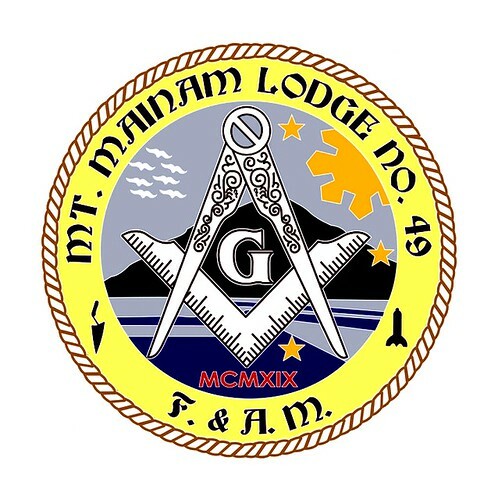 Mainam Lodge No. 49 acquired a lot and erected a temple in Ibayo Estacion, Naic Cavite. The building was destroyed during the Japanese occupation and reconstructed after the liberation sometime in 1945 with the help of all the brethren. Mt. 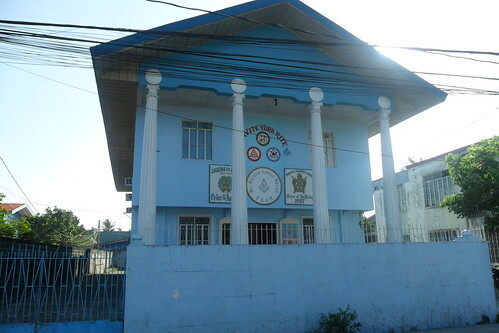 Mainam Lodge had given birth to two other Lodges: Kasilawan Lodge No. 77 organized at the initiative of Bro. Marciano Gatmaitan and Keystone Lodge No. 100, organized by the brethren of Mt. 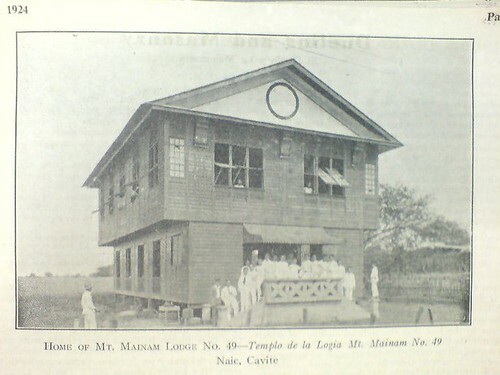 Mainam Lodge who were residents of Corregidor. The building have undergone several repairs and lately was completely renovated. The present building now stand as a majestic symbol of the Temple of King Solomon.